Hi there, and welcome, here are the last three paintings for Inktober. 29 – The image above. Three floaty fish. 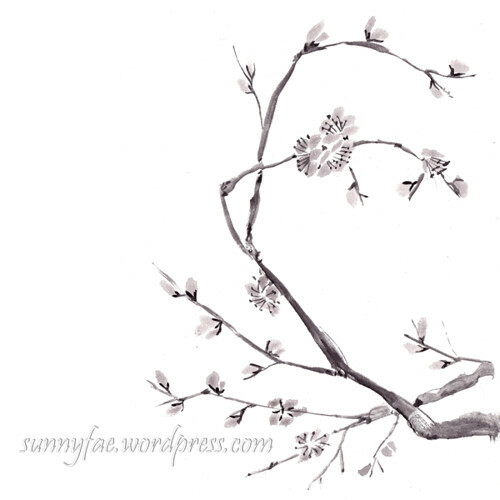 For this painting I followed along with a Youtube video by Henry Li who has an excellent channel filled with tutorials and information about Chinese brush painting. 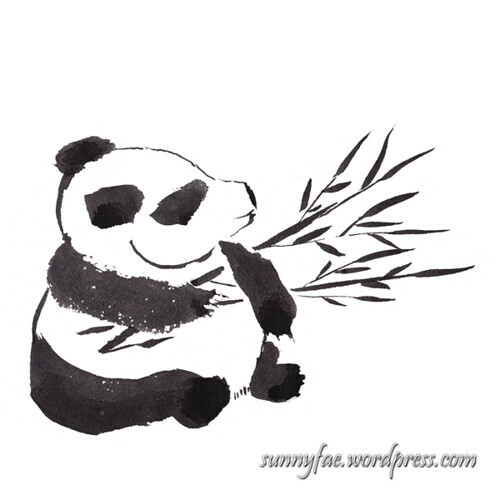 30 – Panda (below). With just a few brush strokes I had painted a panda, who knew this was even possible? 31 – Iris. 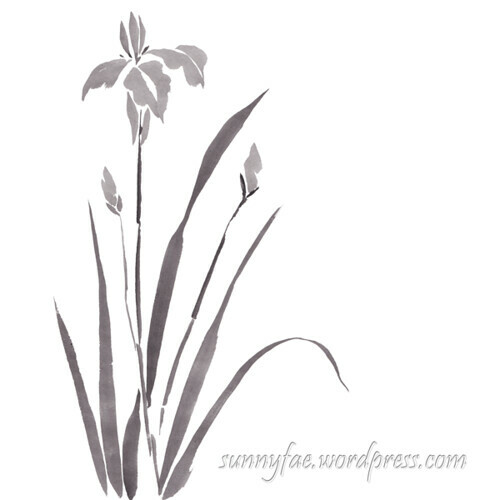 I love iris flowers but had no idea how to approach painting them. Two of the books I’m using had different instructions for iris so I mixed them up and used both. I love how this turned out and am definitely going to try this with watercolour. 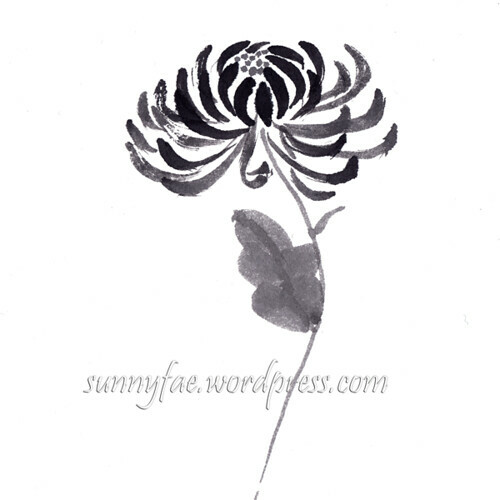 During October I made some cards, it seemed like a good time to practise Chinese brush painting. They were both painted with watercolour and not ink. 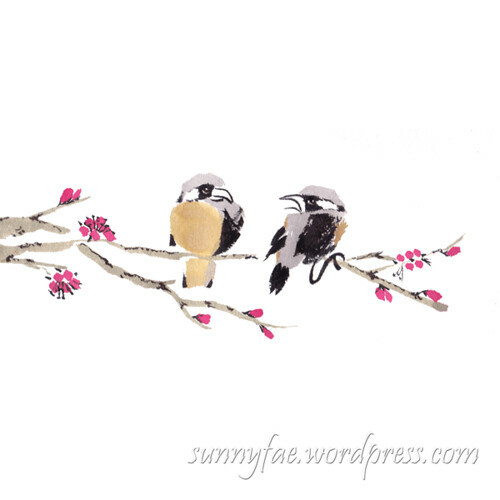 This one was a get well card painted while I was painting little Chinese style birds. 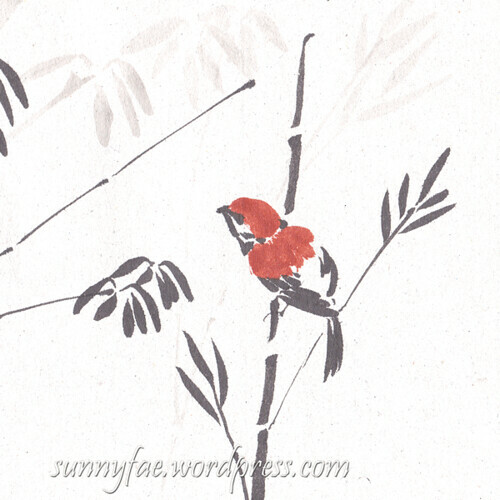 This one was a birthday card painted while I was painting sparrows on a bamboo branch. 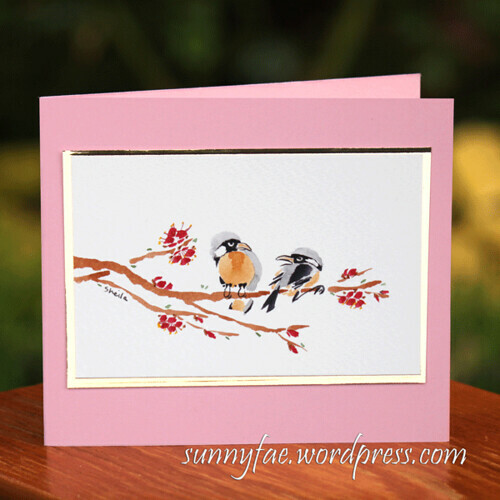 Both cards were inspired by birds painted in week three. 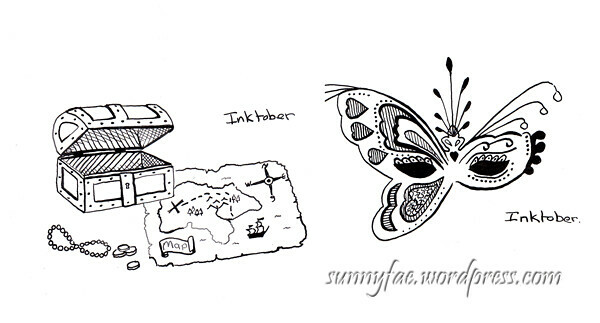 Here’s inktober at a glance, you can see the original blog posts for each week in the links below the image. I can’t believe just how much I’ve learned this month; this style of painting was completely new to me and I wasn’t even sure I would be able to paint anything post – worthy at all. Although I posted 31 images (one for each day of the month.) I practised quite a bit each day. I counted all of the paper used throughout the month and found I had used 157 A4 pieces of paper. Yes I know a weird thing to do but it interested me to find out how much practice and how many mistakes (so many) to achieve something I was happy with. A little stack of 157 practise pages, I’ll have to find a box to keep them in. I was using cheap paper and had no problems messing up and starting again, I don’t think I feel quite so free using more expensive paper. 1. It fascinates me to see the skill someone has to make very simple brush strokes into something totally amazing. 2. If I could even learn the basic techniques it would improve my drawing and watercolour painting. 3. I already had the tools to do this style of painting and I would rather learn to use the tools I have than buy shiny new ones. The brushes aren’t best quality but they worked well enough. Quick summary: I had the most fun Inktober ever learning new skills and techniques. Painting everything from chrysanthemums, birds to irises and has given me the confidence to paint things I wouldn’t have even tried before. I have lots of ideas now I just need time to paint them all hehehe. I would like to thank to everyone for the love, support and encouragement this month you’ve all been amazing! 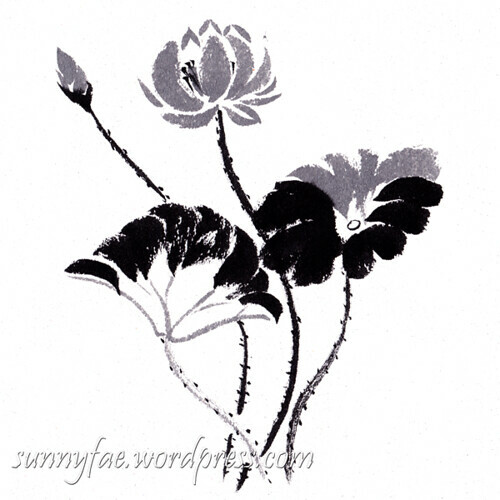 Inkktober day 22 lotus with black ink. Hi there, and welcome to week 4 of inktober. I thought I’d be flagging at this point but I’m still finding this style of painting fascinating. Starting the week with lotus. I had seen pictures but had no instructions in the books I was using and I really wanted to paint some. I found one or two youtube videos and after watching them a few times then set about painting them. 23 – I added some colour to this one on the flower. I’m really struggling with the leaves they’re huge. 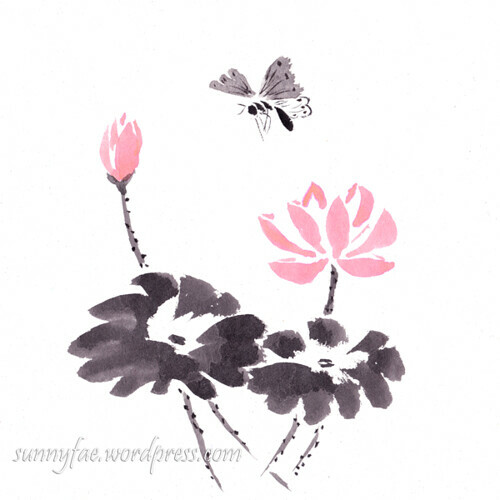 25 – A lotus flower leaves and a butterfly, using the insects I had been practising the day before. 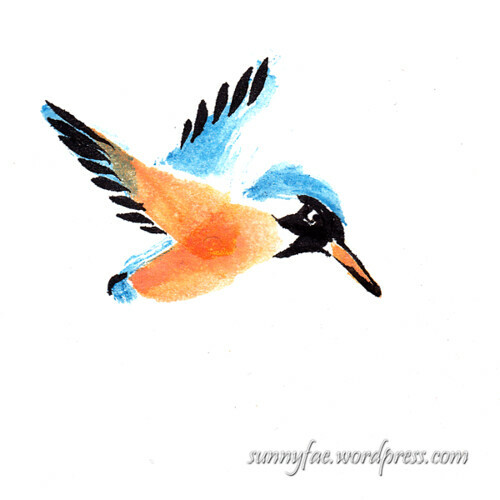 27 – Kingfisher, I love the simplicity of this little guy. 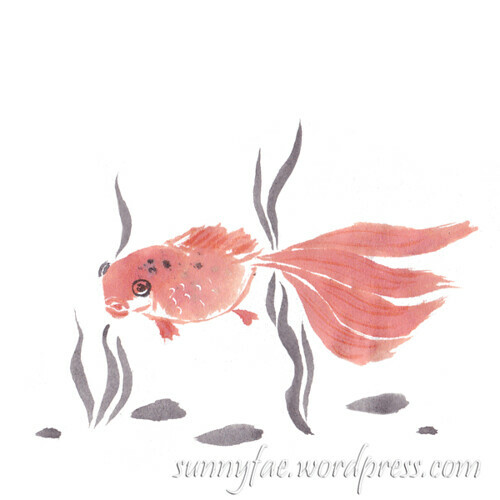 28 – Fish, I think it’s a goldfish, I gave him some weeds and stones for a little background. Not all of the paintings this week had proper instructions, they were pictures in the books I was using but they turned out pretty well in the end. Almost there now, just a few days left then it’s all over for another year. 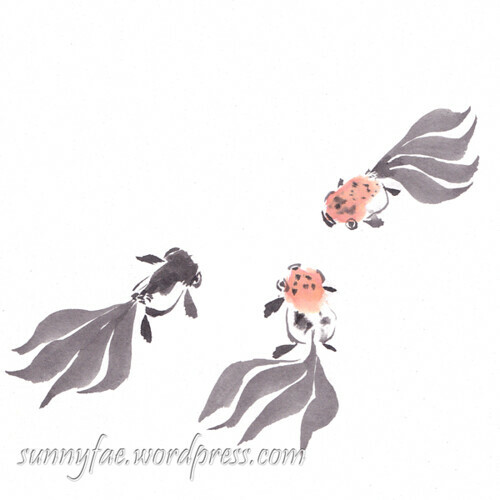 Inkktober Chinese birds on a blossom branch, Day 15. Hi there, and welcome to week 3 of inktober. 15-16 Random birds, the book doesn’t say what kind they are, I suppose you could just change the colours and the shape would work for many little birds. 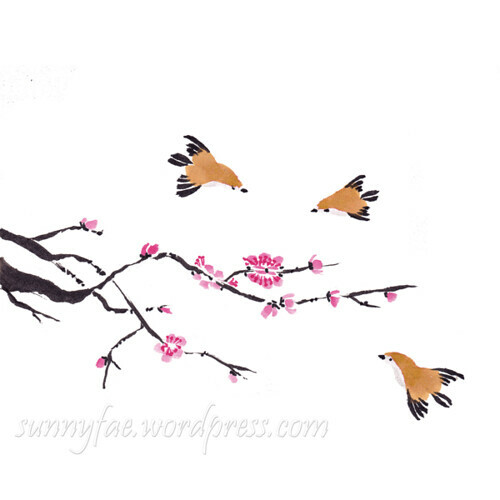 15 – The birds above were painted on a blossom branch as it gives them a place to perch. 16 – Birds on a line, I was just practising the strokes so instead of the birds floating around in mid-air I painted a quick line underneath to represent the branch. Inkktober Chinese birds on a line, day 16. 17-21 Sparrows, these were so much fun to do! 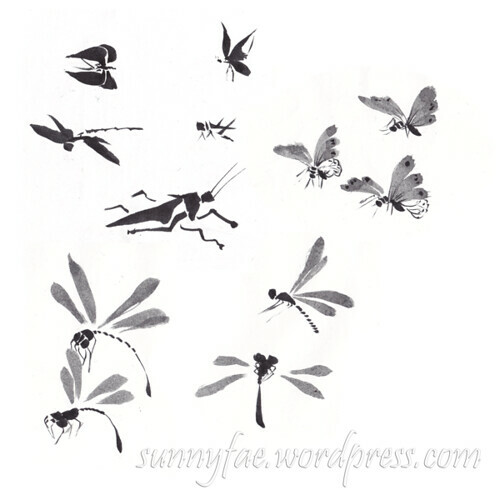 I found a picture from The beginner’s guide to painting: Birds and Insects. Judging by the page I have found I definitely need to check this book out. 17 – I painted a small block of birds on a page; they were all in different positions, perfect for adding to other paintings. Inkktober 9 sparrows, Day 17. Then all I needed was something for them to perch on, I picked bamboo with their flexible stems, I thought they would make good perches. 18 – A small part of a bigger picture, this was the only part I liked so I cropped it in the computer. 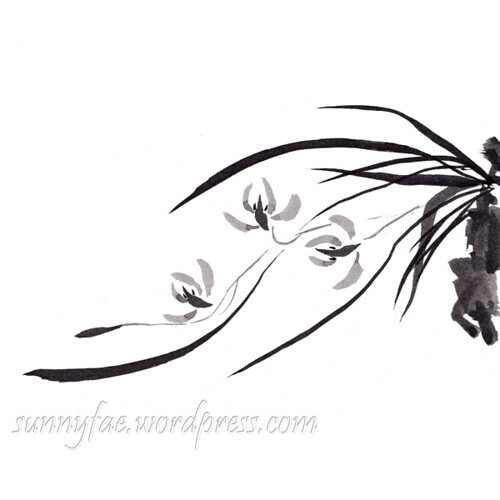 19 – Four sparrows all painted with two tones of ink. It’s all the same ink; I just add more water to dilute it to a paler tone. 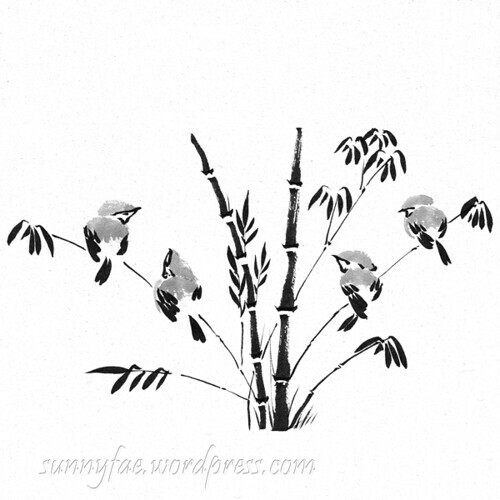 Sparrows on bamboo in black & gray ink, Day 19. 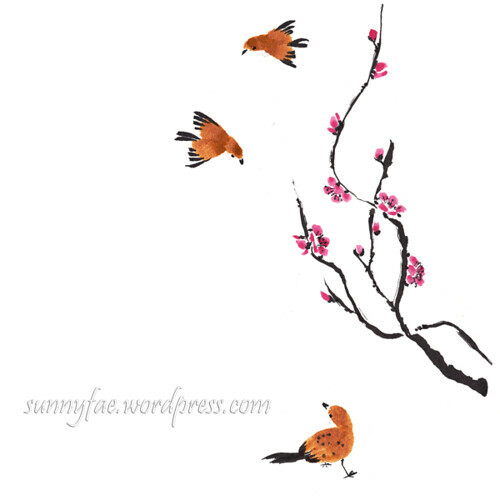 20 – Two little sparrows. I’m mixing my inks here and it makes quite a reasonable brown. 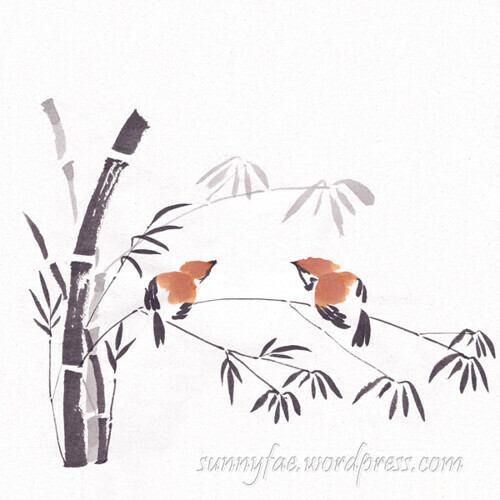 Sparrows on bamboo, Day 20. 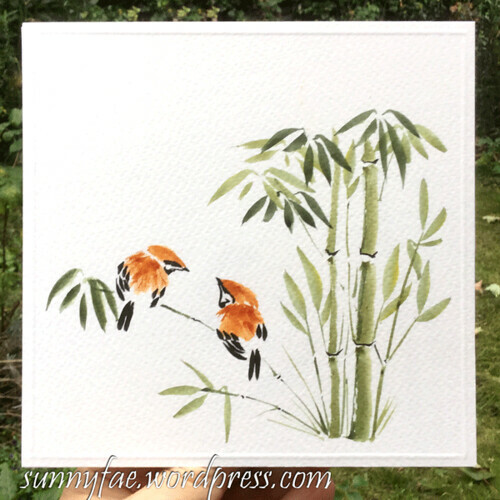 21 – Two more sparrows on bamboo. The beauty of having all of these birds in so many positions you can pick one or more and it is a completely different painting. 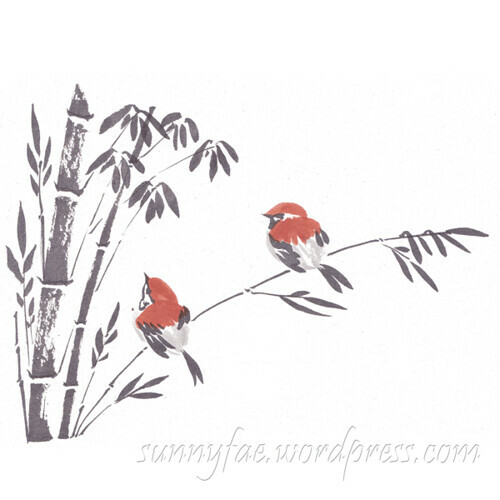 Inktober sparrows on bamboo, Day 21. I could paint these little sparrows all day long and I have many more practice pieces. I’m also sure that it would be very boring for everybody to see but me hehehe, so I’m going to move on and see what else I can find in my books. Inkktober day 14 swallows bonus illustration. Day 8 & 9 Chrysanthemums – two more to finish the trio from last week, adding more flower heads with each painting. 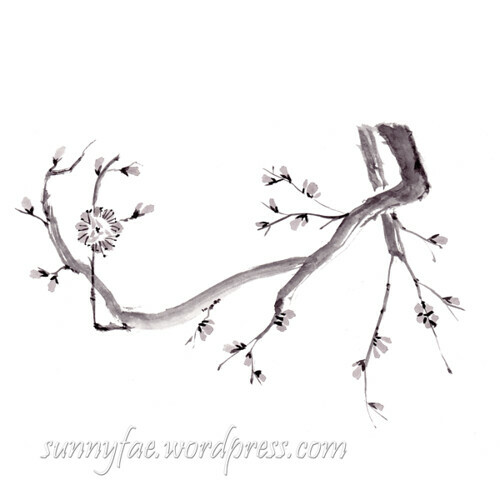 Day 10 – 12 Plum blossom – in the book some flower heads are more of an outline but these are the full petal blossoms. I had a lot more trouble painting the branches, it’s quite hard to paint them and make them look organic. 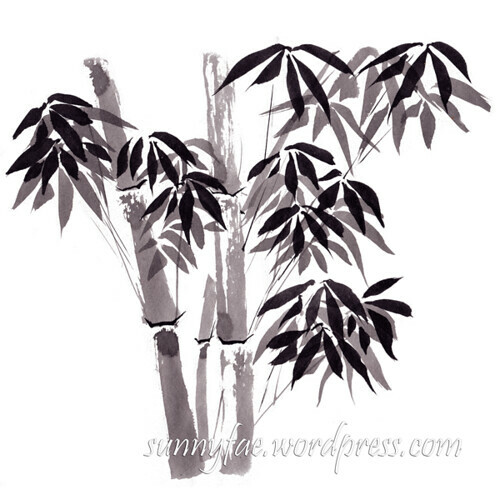 This is the last of the four main exercises all made with either Indian ink or as for the last 5 images sumi-e ink. I’ll spend the rest of the month hopping about the various books doing the exercises that I like the look of and even add a little colour. 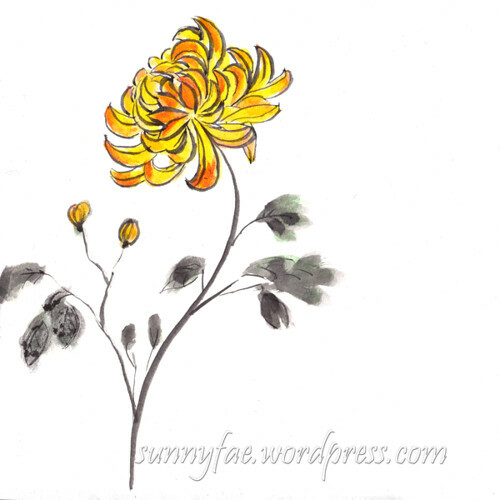 Day 13 Chrysanthemum painted in a different style to the others, slightly more realistic, taken from the book by Cheng Yan. Look at that lovely yellow, whoot! 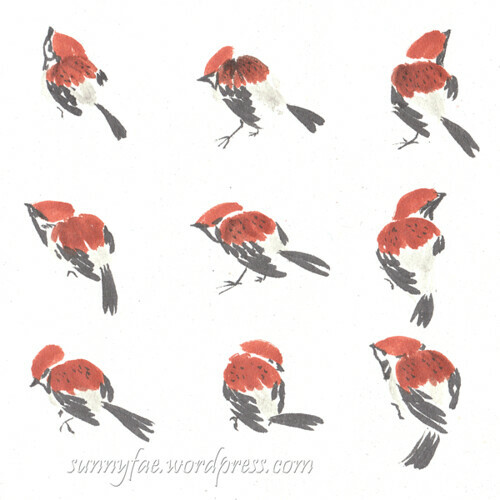 Day 14 Sparrows – these sparrows are made out of a few basic strokes, once you get the hang of how to hold the brush they’re not too difficult and they’re loads of fun to paint. There are one or two more birdie positions in the book but I haven’t quite learned how to paint them yet. (Baby steps hehehe ). 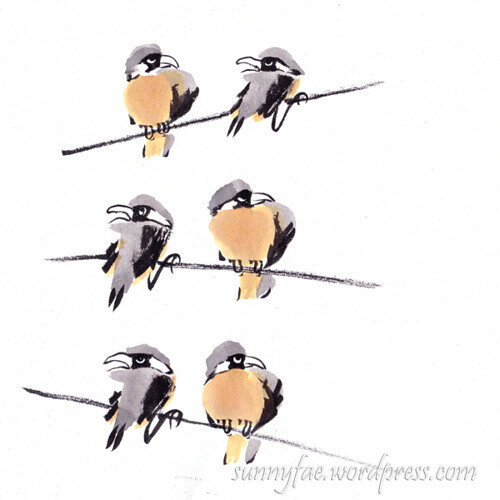 The bonus illustration at the top of the post is also of some sparrows. 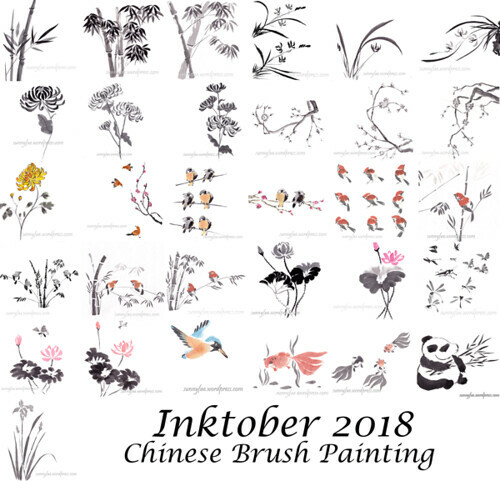 Traditionally the colours used in Chinese brush painting are watercolours but since it’s inktober I’m sticking with ink. The colours I have are limited to black – (Indian or sumi-e ink), yellow, blue and red – (pergamano ink), I don’t really like the pergamano ink because it contains a lot of shellac, it stains and if it’s not washed off tools, brushes etc. its stuck there for ever! I need to use it up so that’s what I’m using. It’s been an interesting week and I feel like I’m learning a lot. Hi all, wow are you? 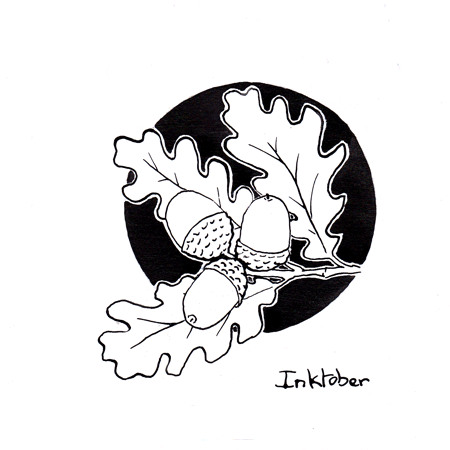 It’s that time of year again, inktober. As I said last week I wasn’t really going to participate this year due to a case of the bleah’s. 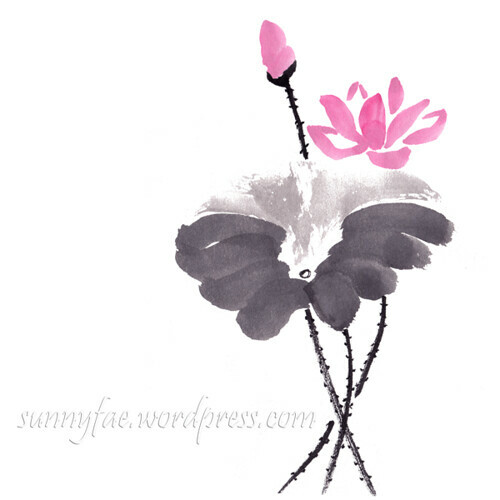 Then I hit on the idea of doing something completely new to me, Chinese brush painting, I’m so glad I did. Here are the covers of the books I’m using. know very little about this subject so I’m using three library books for reference. 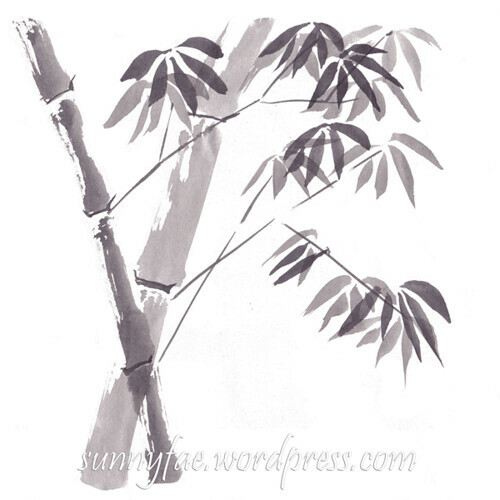 Chinese brush by Jane Evans. Not a bad book for a beginner – gives stroke direction and basic strokes needed for the first exercises, lots of lovely colour illustrations, some advanced stuff at the back. 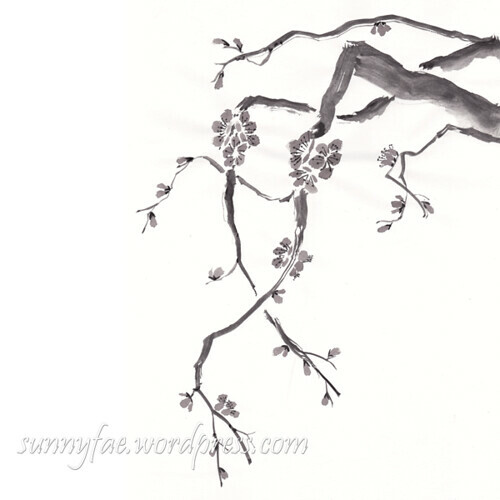 Chinese brush painting traditional & contemporary using ink and water-soluble media by Cheng Yan. A beautiful book with loads of lovely colour illustrations but not a book for beginners. This book has no bells and whistles, no shiny coloured illustrations, just good basic information on brush strokes and why or where to use them, A very good beginner’s book. 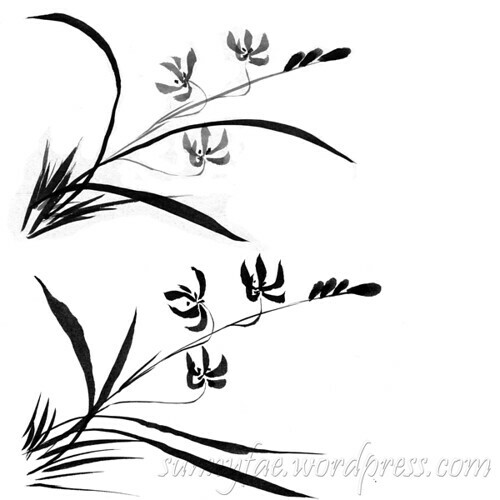 There are four basic seasonal objects from nature to paint called the four honourable gentlemen. For some reason all of the books do these lessons in different orders!? 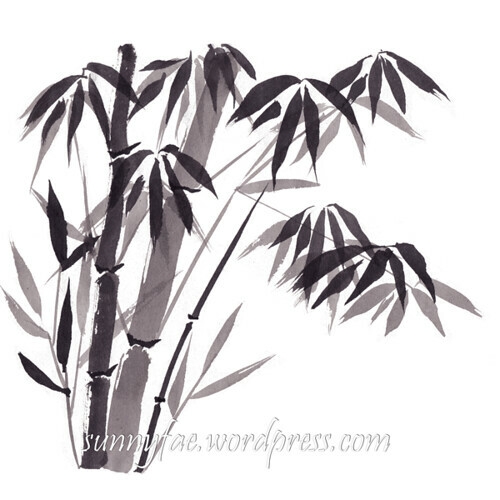 These exercises teach everything you need to know to learn all of the strokes needed for Chinese brush painting. 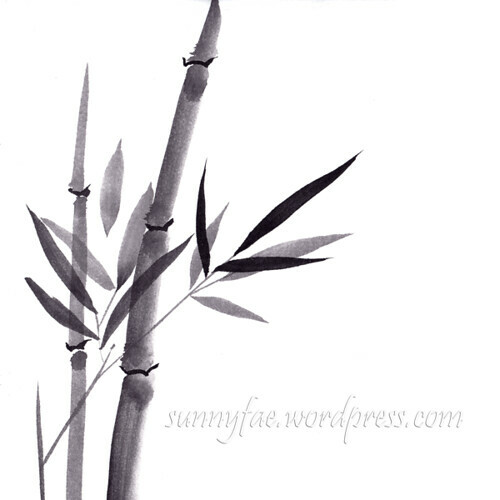 Top painting is a bonus bamboo – an extra bamboo that was painted but not posted, I quite like it so I put it here. 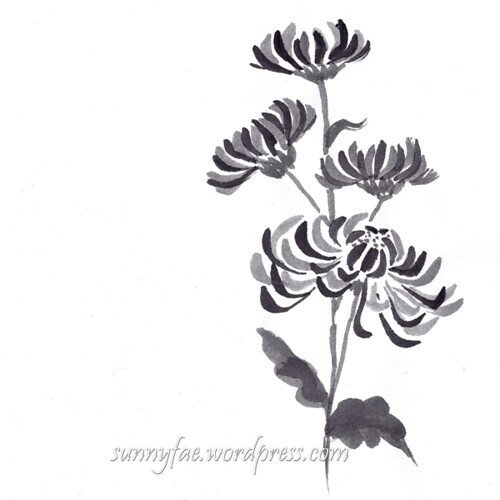 Day 07 Chrysanthemum – so many petals. To be honest though it’s just different lengths of the same stroke so when you’ve learned the stroke it’s not too difficult. 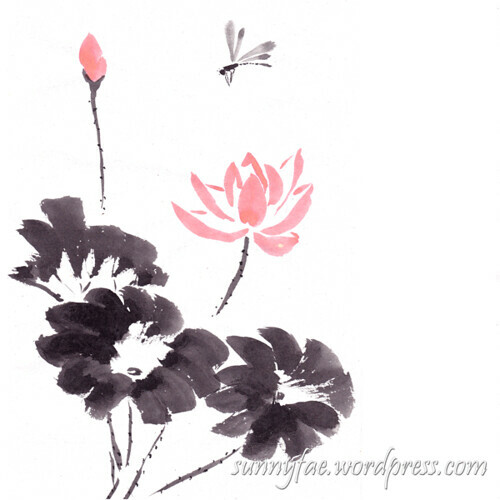 Traditional paper for Chinese painting is usually rice paper, I don’t have any and reading the books they say any absorbent paper like news print is fine. 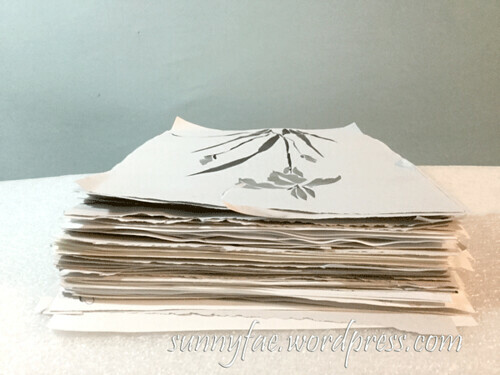 I’m using a mixture of news print copy paper and some kids drawing paper that I’ve had knocking about for years, they are all very absorbent and I have found the kids drawing paper works very well for the bamboo. 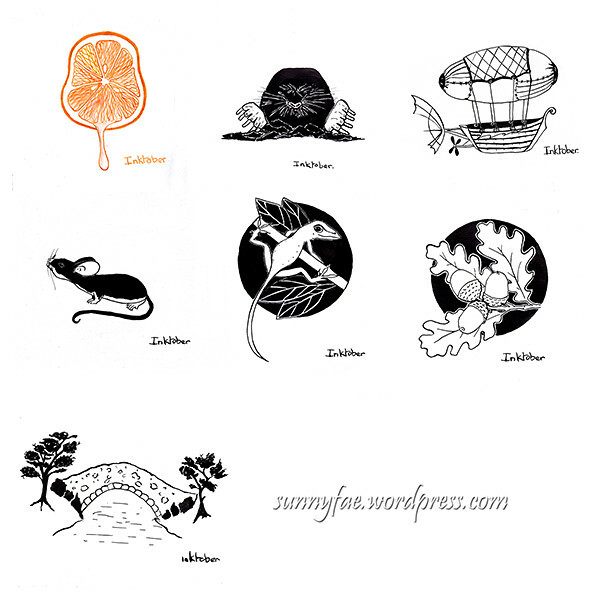 It’s fun to take part in this challenge and also a lot of fun checking out other people’s inky efforts. There is a lot of amazing artwork going on around the internets. The End Of Inktober 2017 Whoot! Hey ho folks, how are you? 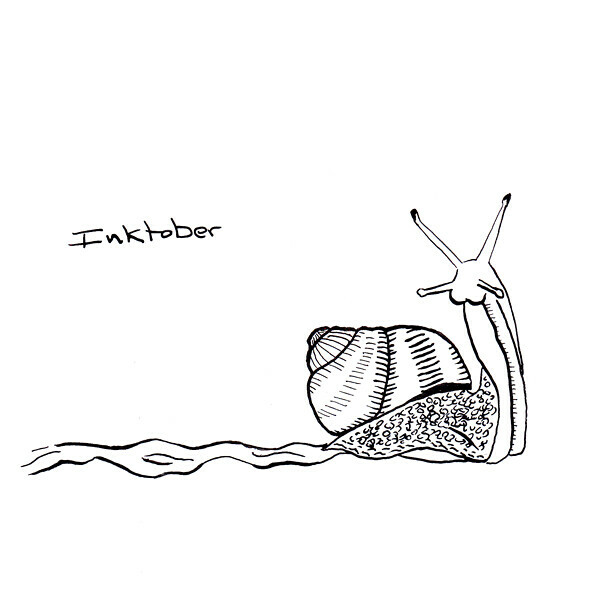 We did it, inktober is over for another year Whoot! I managed to keep to the prompts for all but one of them because mysteriously I had nothing for that day hehe. Day 30 found – as in they found the treasure. During inktober I have managed to fill up half of a sketch book (or there abouts) 27 pages both sides, normally it takes me four or five months so it has definitely made me draw more. Some of the prompts were a bit random so I was pushed way out of my comfort zone quite a few times which is a good thing I suppose, it does show up the weakness in my drawing capabilities though. Obviously this means I need to do lots more drawing to gain these skills. I hold a pen far too tightly which inhibits the flow of pen movement, I need to loosen up a bit. Turning the paper around more means I can produce a smoother line. Dip pens run out quickly so make sure to dip before putting pen to paper each time. dip pens are messy, watch out for the splotts. 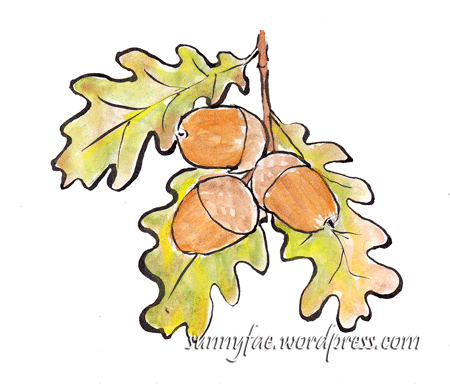 This is one of the pages from my sketch book for day 26 squeak. 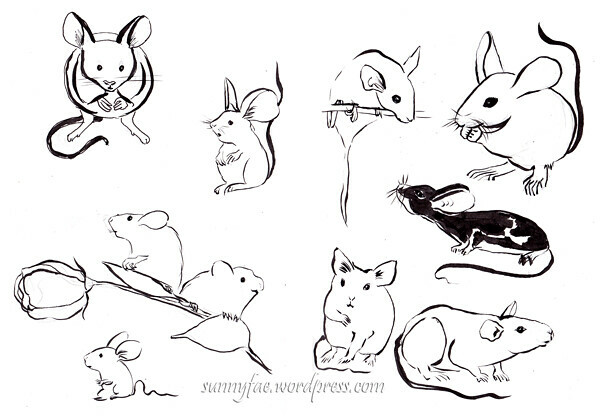 Theyre not finished (some of them are a bit wonky) or coloured in, I just needed an idea of what a mouse looked like. I chose the little black one from the second page, he was kind of cute. Having to post something every day was a bit scary especially if the thing I’d drawn wasn’t something I thought good enough for posting. Every day I got to draw lots of things I wouldn’t normally draw. There was some amazing art made by other people, it’s always enjoyable clicking on the hashtag and finding out how everyone else interpreted the prompt. I got to use supplies that usually sit in a draw gathering dust and expand my skills. 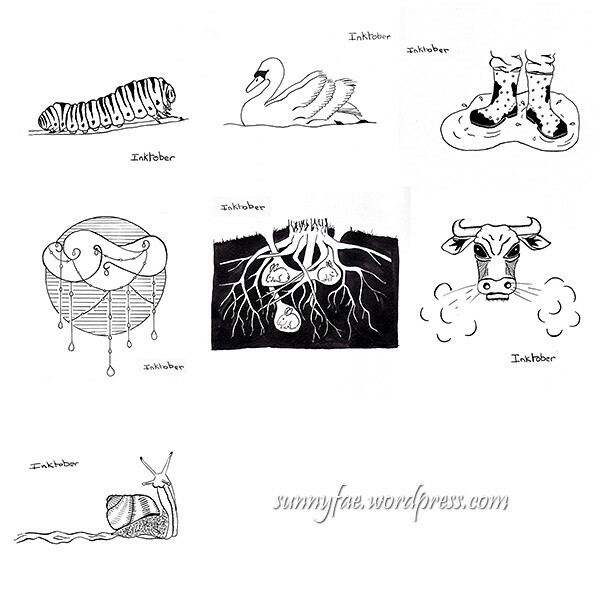 We’re on week four of inktober, (nearly finished), just two more to go! I’m still sticking with the prompts, which has surprised me as some words were a bit of a struggle. I’m also still using the dip pens although I did change out the nib to a more flexible one. It’s helping with the line variation. Working out the prompt in my sketch book. 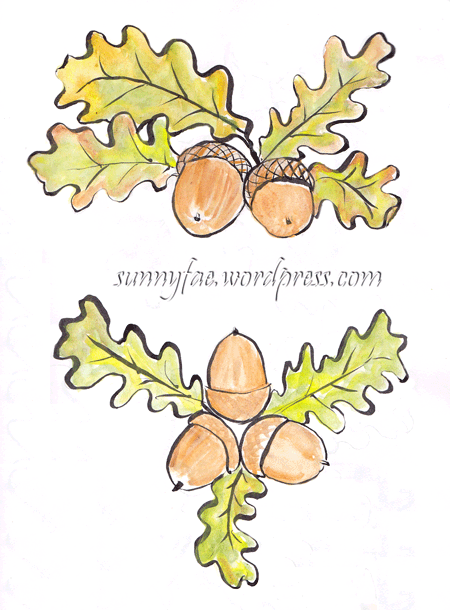 These are some acorns I’ve drawn in my sketchbook as I tried to work out what to draw for day 28 (fall) and decided to colour them in, I’m missing colour at the moment as everything I’m doing is black and white or very limited in colour. This is the image I chose for the prompt. It looks very different in the picture below in black and white. There’s just two days left and then it’s all over for another year so I think I’m going to make it to the end, next week maybe I’ll have a think about what the effects have been and what I’ve learned during the month. #inktober 2017 numbers 16-22 indian ink and dip pen. It’s week three of inktober, still sticking with the prompts, and good grief some of them are challenging. There are always one or two each week that I’m not fussed with, either the prompt didn’t excite me or the picture didn’t come out as well as I wanted it to. On these days I have to look back at what I had intended the goal for this month to be. Then I do the picture post it up on instagram regardless of how much I like it, otherwise I’ll drive myself crazy with inner critic issues and nothing will get done! I had decided I would use my dip pens and ink, these are not tools I’m very familiar with but since I have them I wanted to try to learn how to use them. Normally I draw something in my sketch book and use a brush pen for the lines, then when I’m happy with it transfer the image lightly in pencil to the book I’m keeping all the inktober’s in. 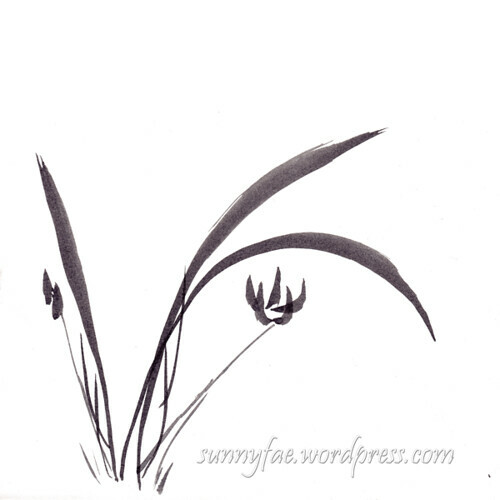 They are then inked with Indian ink and a dip pen. Drawn with a pencil. 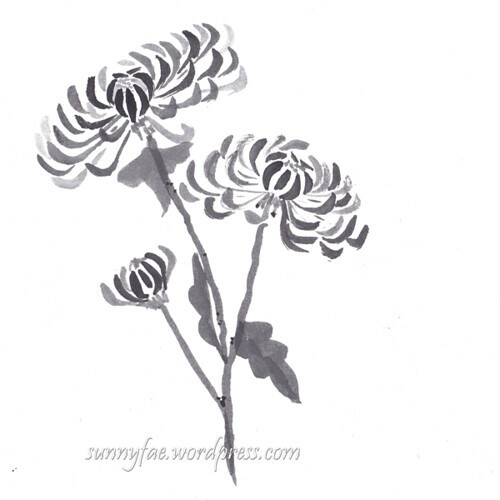 lined with a dip pen and indian ink. Click this picture to view on instagram. 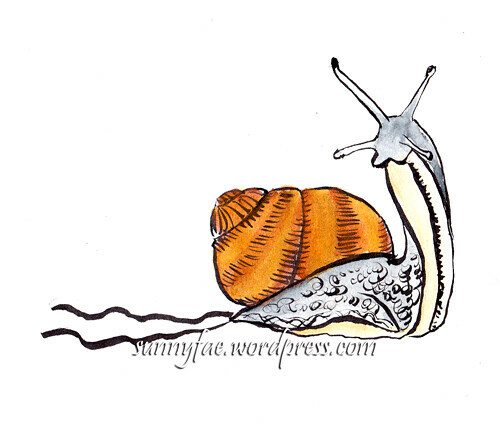 You can see the difference in lines between the brush pen and dip pen in these two snails here, I am getting some variance in line now with a dip pen, it’s not brilliant but it is better, I still prefer the brush pen at the moment.